Can I use cold water to dye rayon with Procion MX dyes so it doesn't shrink? Message: I couldn't find the answer to my question. I bought some Dharma Procion MX dyes to dye some of my rayon clothes (viscose rayon). I don't want to heat the water very high because the rayon garment will shrink. 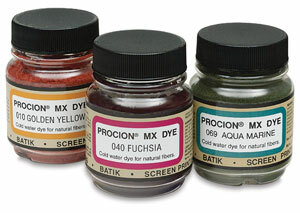 Can I use the Procion MX dyes in cold water, and, if so, how do I do that? Thank you for being such a wonderful mentor to all of us. Yes, you can do this. Rayon will dye very nicely with Procion MX fiber reactive dyes in room temperature water, as long as it's 70°F or warmer; that is warm enough for the dye to react with rayon or cotton, in the presence of soda ash. Procion MX dyes are known as "cold water" dyes, but the word "cold" in the textile industry doesn't mean quite what it does in any other field. The water must be at least lukewarm, not actually cold. Recommendations vary on how cold the water must be to avoid heat-related shrinkage, but you should certainly be safe below 85°F. That gives you a reasonable temperature range to aim for. Some of the same warnings apply as for yesterday's question ("How can I dye a washable bright yellow lined wool peacoat? "): not all garments are dyeable, and you can assume that some of them will not turn out well, due to uneven dyeing (though this is not as big a problem for tie-dyeing or LWI-dyeing as it is for solid-color dyeing). However, dyeing rayon in cool water is an easier project than dyeing wool, so you are likely to be successful with many of the garments you try to dye, as long as they are unlined. Keep in mind that the stitching that is holding your rayon garments together is almost certainly made of polyester, unless you bought the rayon clothing from Dharma or another supplier of blanks for dyeing, so it will remain the original color. A special warning for rayon is that it is fragile when wet, so be gentle with it whenever you wash or dye it. Normally we use hot water for prewashing clothing before dyeing. Since you want to avoid hot water, just wash as thoroughly as you can in the water temperature you usually use for these clothes. The biggest pitfall is invisible stains on clothing that has been worn before, or even on some new clothing that is not labeled "PFD" or "RTD" ("Prepared For Dyeing" or "Ready To Dye"); they can cause odd undyed spots, since they prevent dye from reaching the fiber, but in most cases you will be okay. We also usually use very hot water (140°F or hotter) to wash out the unattached excess dye, after dyeing, after first doing one wash cycle in cool water. Here again you can get by without the hot water, but you will have to be more careful about the possibility of unattached dye running. If you dye clothing with Procion MX dyes and then wash them in very hot water, they will later be safe in the laundry even when washed together with white clothing in hot water, because the hot water removes all of the unattached dye; however, if you do not wash out your dyed clothing with hot water, you should be careful to sort your laundry by color to avoid problems. Washing thoroughly in cool water is sufficient to prevent crocking later on, which is when dry fabric rubs dye onto other things, but not to prevent some unattached dye from running when wet. Wash your dyed clothes repeatedly in whatever temperature of water you are comfortable with, until you see no more dye in the water; afterwards, be careful not to leave the clothes in contact with other fabric when they are wet. For example, don't toss a damp shirt onto a light-colored couch, and don't leave slightly damp clothes in a pile together. 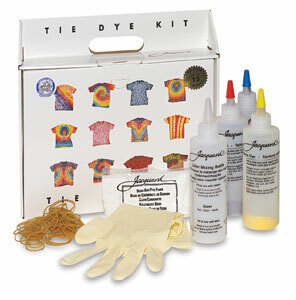 Another point is that we often wash out all of our different-colored tie-dyes together, knowing that very hot water will remove any unwanted dye transfer, if it occurs after all of the dye has fully reacted. I dump every color into the washing machine at once, without problems. Since you will not be using hot water, you must be very careful to avoid washing multiple colors together. If you do dye a cool-water-only piece with strong color contrasts, rinse it out extremely well by hand, separately, taking care to rinse darker areas so that the dye run-off does not run over the lighter parts of the fabric.